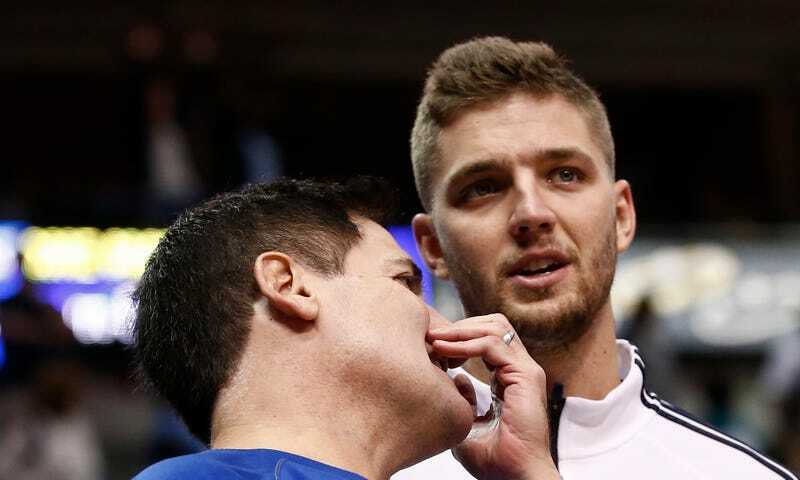 ESPN’s Tim MacMahon has a fascinating story about Chandler Parsons and Mark Cuban up today. The story is essentially a timeline of all the behind-the-scenes events that led to Parsons leaving the Mavericks for Memphis this offseason, but what it is really about is the death of a bromance. “The main reason why I went to Dallas was because I had an owner that was my boy and who believed in me,” Parsons says. “That’s an awesome combination to have. As my years went on there, I think there was a huge jealousy factor of how cool I was with him, how I had some power and input in decisions that they make. I think that hurt some people’s feelings. I think that made them jealous. It was a pitch that Parsons considered “pretty ludicrous,” even borderline disrespectful. He never remotely considered it. Will Parsons and Cuban every become ride-or-die boys again, or will things remain unchill and hella awk? Read MacMahon’s story, and decide for yourself.